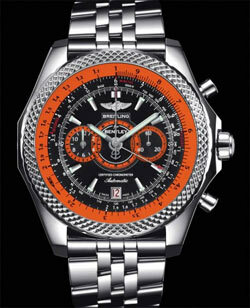 Baselworld 2012 Breitling has seen off the track with three new Limited Edition of 1,000 copies each, the chronograph Bentley Supersports first appeared in 2010. The dial-inspired dashboard is framed by a very pronounced with flange rings, depending on the edition, blue, orange or white. Designed for use and extreme sports, and high performance, this watch is a tribute to the new Bentley Continental Supersports, the standard car more powerful and faster set up by the British manufacturer, holder of world records speed skating . 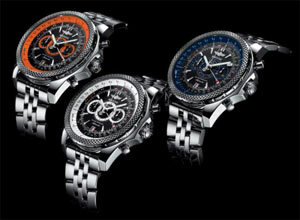 A super-chronograph for a supercar. Each of the three limited edition Breitling Bentley Supersports holds in its robust and elegant case sports a mechanical automatic movement with COSC chronometer certificate issued. The second hand is drawn from an original 60-minute counter at the center. The rotating bezel is used to activate the variable tachometer exclusivity watches Breitling that measures an average speed whatever the time elapsed, distance traveled or the speed reached. It shows a ridged profile that incorporates the typical commands found in Bentley cars.